I can sideload whatever APK I want which is no problem but this message keeps popping up constantly. Is there anything I can do to fix this? Let me know. I am a new purchaser and ran into this problem. Is there a fix? This is not acceptable for any product, let alone an expensive one. Please go to Settings — Application — Enable Google Play — GSF ID to active the Google account first. After 5 minutes, you can try to reboot your device and sign in the Google Play account. You could learn more from this video. I have the same issue, however I don’t have the option for GSF ID. I just ordered this device and got it in the mail today. On my device I have to go to Settings --> System --> Power Manager. Here I have the option to toggle “Enable Google Play”, however I don’t get anything further, nothing asking me to login and nothing about GSF ID. 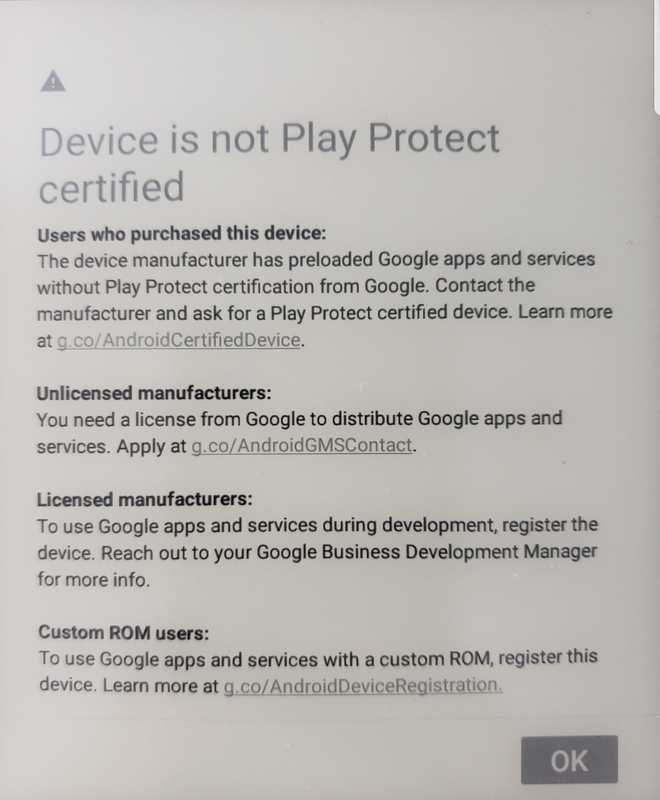 When I go into the Account Manager and go to the Google option to try to login to my account, it just returns me to that same “Device is not Play Protect certified” alert and I can’t do anything else. Is there something I’m missing? I just spent over $500 on this device specifically so I can download onedrive and some note taking apps and right now I’m dead in the water.